In parts one and two of my article series about programming with the ncurses library, I introduced a few curses functions to draw text on the screen, query characters from the screen and read from the keyboard. To demonstrate several of these functions, I created a simple adventure game in curses that drew a game map and player character using simple characters. 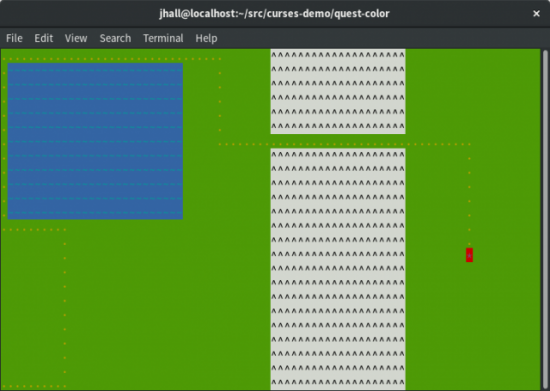 In this follow-up article, I show how to add color to a curses program. Drawing on the screen is all very well and good, but if it's all white-on-black text, your program might seem dull. Colors can help convey more information—for example, if your program needs to indicate success or failure. In such a case, you could display text in green or red to help emphasize the outcome. Or, maybe you simply want to use colors to "snazz" up your program to make it look prettier. In this article, I use a simple example to demonstrate color manipulation via the curses functions. In my previous article, I wrote a basic adventure-style game that lets you move a player character around a crudely drawn map. However, the map was entirely black and white text, relying on shapes to suggest water (~) or mountains (^), so let's update the game to use colors. Before you can use colors, your program needs to know if it can rely on the terminal to display the colors correctly. On modern systems, this always should be true. But in the classic days of computing, some terminals were monochromatic, such as the venerable VT52 and VT100 terminals, usually providing white-on-black or green-on-black text. Having determined that the terminal can display color, you then can set up curses to use colors with the start_color() function. Now you're ready to define the colors your program will use. The program now has a more pleasant color scheme, more closely matching the original tabletop gaming map, with green fields, blue lake and imposing gray mountains. The hero clearly stands out in red and magenta livery. Figure 2. The player starts the game in the lower-left corner. Figure 3. The player can move around the play area, such as around the lake, through the mountain pass and into unknown regions. With colors, you can represent information more clearly. 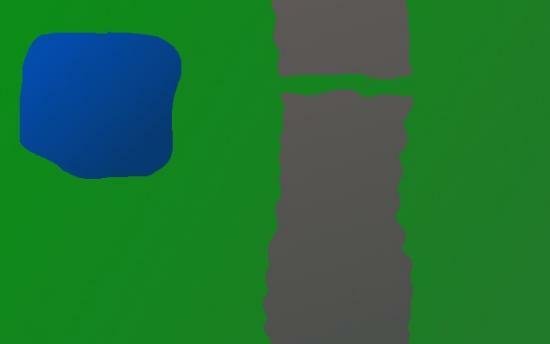 This simple example uses colors to indicate playable areas (green) versus impassable regions (blue or gray). I hope you will use this example game as a starting point or reference for your own programs. You can do so much more with curses, depending on what you need your program to do. In a follow-up article, I plan to demonstrate other features of the ncurses library, such as how to create windows and frames. In the meantime, if you are interested in learning more about curses, I encourage you to read Pradeep Padala's NCURSES Programming HOWTO, at the Linux Documentation Project.